Sorbitol is a sugar alcohol that the human body metabolizes slowly. 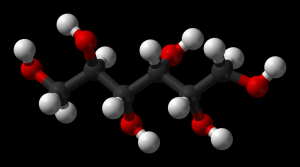 Sorbitol is obtained by reduction of glucose, changing the aldehyde group to a hydroxyl group. In nature, sorbitol is found in apples, pears, peaches, and prunes, but it is also synthetized by sorbitol-6-phosphate dehydrogenase and sorbitol dehydrogenase, and converted to fructose by succinate dehydrogenase. Sorbitol is often used as a sugar substitute in diet foods, mints, cough syrups and sugar-free chewing gums. It is also consumed as a non-stimulant laxative that works by drawing water into the large intestine and stimulating the movements of the bowel. It is often used by dieters and in the treatment of diabetes, as it does not affect the level of glucose in the blood of a patient. Another medical application is to distinguish the pathogenic Escherichia coli from most other strains of this bacterium. Pathogenic E. coli is unable to ferment sorbitol. This sugar alcohol is also used in cosmetics as a humectant and thickener, as well as in mouthwashes and toothpastes and different gels. Generally, sorbitol is considered safe for human use. However, health problems may occur if the sorbitol is consumed in large amounts and over long periods of time. Symptoms associated with sorbitol side-effects are usually mild and result from stomach’s inability to properly digest sorbitol. Sorbitol is not fully digested by the small bowel. From the small bowel, sorbitol moves into the large bowel where it begins to ferment causing various unpleasant symptoms such as irritable bowel syndrome, dehydration, diarrhea and weight loss. Bacteria which normally found in the stomach cause fermentation. As bacteria ferment they produce gases responsible for various abdominal problems. Dehydration usually results from rapid bowel movement and diarrhea, characteristic for abdominal distress. As one consumes large quantities of sorbitol during a long period of time, the buildup of sorbitol increases in the stomach and causes more severe symptoms. Fermentation will finally stop once the source of sorbitol is excluded. Ingesting large amounts of sorbitol, at least 10 g per day, greatly increases an individual's risk of developing diarrhea and accompanying symptoms. There is no evidence demonstrating a hazard where sorbitol is used in recommended dosages. The U.S. Food and Drug Administration’s regulation for sorbitol requires the following label statement for foods whose reasonably foreseeable consumption may result in the daily ingestion of 50 grams of sorbitol: “Excess consumption may have a laxative effect.” Recommended daily dosage of sorbitol should not exceed 30 gr.